Ayvalik is a traditional seaside town on the Northern Aegean sea in Turkey. It is located on the southern coast of the Gulf of Edremit, just across from the eastern coast of the Greek island of Lesbos. It is situated on a narrow coastal plain surrounded by low hills to the east which is covered with pine and olive trees. It is a place steeped in history as it was an important trade centre during Ottoman times, with the cities inhabitants then being almost wholly Greek. When a population swap was mandated between the governments of Turkey and Greece in 1923, the Turks from Crete moved in. The fusion of local Greek and Cretan cultures have created a wonderful character that is today’s Ayvalik. While most of the physical, historical heritage is Greek, the everyday culture lived on the streets between those buildings, including the local food, is mainly Cretan. Ayvalik is undoubtedly Turkey’s secret spot, which means you can enjoy riding here with realistically only and a handful of kiters around you. The water is flat as a lagoon and crystal clear, with pumping winds up to 30 knots. One of its highlights has to be the fantastic sunset sessions. There’s nothing like riding into the sunset, but here you can watch the sun disappear behind a small island as you are kiting. The kiting area around kite beach is approximately three nautical miles (over 5 km!) which means there is plenty of space for everyone! Ayvalik relies mainly on the Meltemi which blows through the Greek islands in the summertime, however, here it is accelerated by a thermal wind making it that little bit stronger and more reliable. The water is flat and shallow making it the perfect spot to learn to kitesurf, freestyle and enjoy freeriding. The town of Ayvalik is split in two; Cunda island and downtown Ayvalik. Whichever end of town you decided to stay there are plenty of restaurants and bars all serving up delicious traditional cuisine. Aaron Hadlow and Sam Light have both visited the spot and enjoyed it this undiscovered spot. During the summer months, the same strong northwest wind that blows through the Greek islands of Karpathos and Naxos also passes through Turkeys west coast. In Ayvalik the wind comes mainly sideshore but can occasionally turn a bit to side on-shore. This means you can enjoy the whole expanse of the area and because it is flat everywhere, you will be riding your tacks from the beach to the shipwreck and beyond without it ever feeling crowded. Although the wind does blow between mid-June to mid-September, it is recommended to come in July and August when it is at its most reliable. Windguru cannot predict the wind precisely due to the huge plane north of the spot, which creates a thermal acceleration. However, even a light northerly wind forecast combined with high temperatures around 28-30 degrees Celsius means a solid 12m day! The rest of the time expect to be on 9’s and 7’s. There is a local Dolmuş which runs from downtown Ayvalik directly to the kite beach and back approximately every 15 minutes. However, a hire car is recommended and preferable. There are plenty of restaurants in both downtown Ayvalik and on Cunda all serving Turkish cuisine, however if you like fresh fish head over to Cunda (if you’re not staying there) one evening for a plethora of fish restaurants and a huge variety of freshly caught seafood, all along the quayside. For a quick snack, this place is famous for its Ayvalik Toast, a delicious toasted sandwich which you will find almost everywhere. If you come in July and August it is very unlikely that you will have a no wind day, however, if you are unfortunate to have one, Ayvalik is big, and there is plenty of exploring to do. A lazy afternoon wandering around the tiny back streets on Cunda Island, soaking up the beautiful old Greek Architecture, local artisan shops and stopping off for a Turkish çay or coffee, will while away the hours. Alternatively, climb up through the meandering back streets of downtown Ayvalika and enjoy the stunning view when you reach the top. Ayvalik is the place in Turkey to stock up on Olive Oil as this is the region the majority of it comes from. There are many boat trips around the local islands, which leave daily along with plenty of diving trips. It is also possible to make a day trip to Lesbos. If you have a car and want to explore there are many historical sites which can be visited within a day, such as Assos (Behramkale), Bergama (Pergamum) and Troy. ADSL is available nearly everywhere in both downtown and Cunda. With plenty of Wi-Fi hotspots in the bars and restaurants. There is a huge range on offer, depending on your budget you can choose between, hostels, bed and breakfasts, and hotels. Sarah and Mark discovered Gökova Bay in 2010 and firmly put it on the international kitesurfing map. Always Windy offers a complete service to take the hassle out of organising your trip. Been to Ayvalik? What did you think? 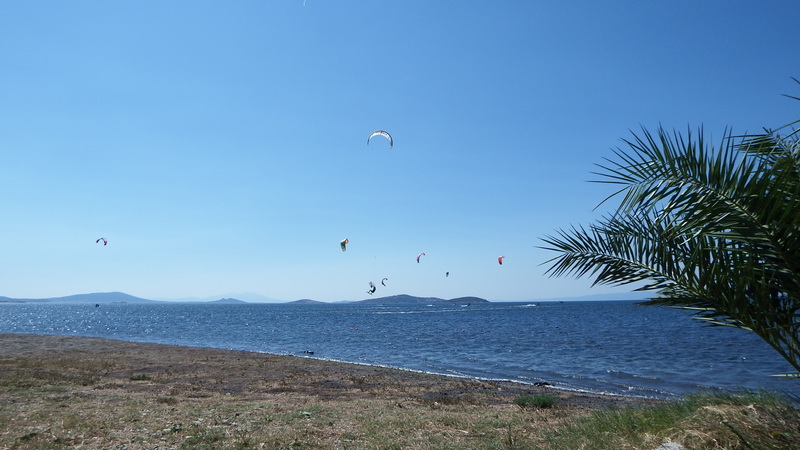 Where are the Best Kitesurfing Beaches in Ayvalik? Here you will find the kite station with all facilities including a restaurant and second is the causeway, which has no amenities. You can do a downwinder from Kite Beach to the Causeway. However, it is only advisable to do as part of an organised trip as you need to know the area and have someone ready to land kites at the other end. A little way upwind of Kite Beach is the Causeway this is a man-made road that links the mainland to a couple of the nearby islands. The wind blows directly offshore but the water is as flat as you can get, it's perfect for speed runs and freestyle! There is a small beach to launch and land from; it's one of the best flat water spots we have ever discovered! 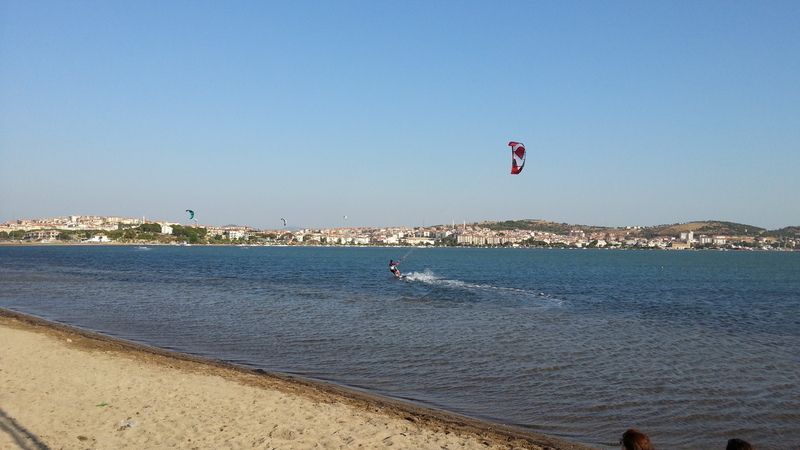 When is the Best Time to go Kitesurfing in Ayvalik?